I most recently loaded Chickenfoot LIVE, Rare & Unreleased "Going Down" from the first performance from the band, ever, before production of the first studio Chickenfoot album. This was played at the Cabo Wabo Cantina in Cabo. The awesome, raw power of the combination of these four different personalities, merged into the greatest marriage in Rock and Roll history, is clearly evident. It is the nature of every Relentless Rock fan out there. It is what ever Relentless Rock band aspires to be. They had it. They have it. You could feel it then like you can feel it now. Beware the Foot! I made the video of "Down The Drain" from a collection of pictures and art work. The pictures from the audience I took from the floor with my camera phone at the Detroit show. The art work that takes your breath away is courtesy of 5150 Design and used by permission. I made this on a Mac. The audio is from one of the first shows, if not the first show, of Chickenfoot. The introduction is from the end of "Get It Up" and could not be left out with the nature of this song being exactly what Sammy Hagar explains; a jam, for 25 minutes, and he came up with the lyrics, later. This is what you call the highest level of "spontaneous organization" and "improvisation" and it is the evidence of the musical prowess of Chickenfoot. I hope you enjoy this video as much as I enjoyed making it. It is an excellent song and they play it live just like the album because THAT's what it is. Spontaneous Organization. That should be the name of the next Chickenfoot album. 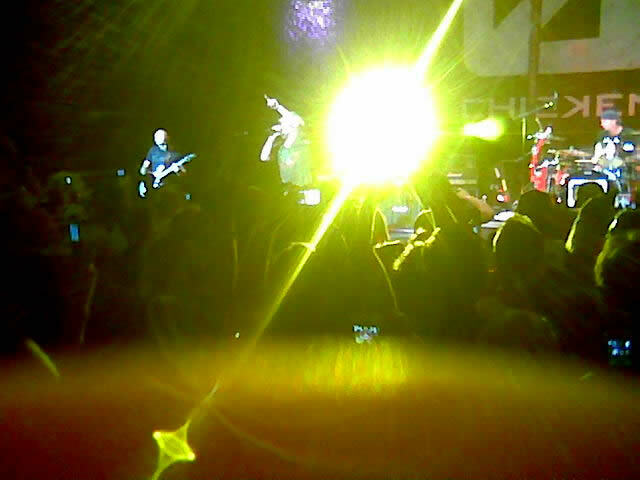 "Spontaneous Organization"
Here's a view of Chickenfoot from about seven bodies back, at the Filmore in Detroit. Detroit - 8/8/09 Seeing Chickenfoot on 8/8/09 at the Fillmore in Detroit, was exactly what I expected. Everyone on stage performed at the highest level. I had seen all before except Smith. Sammy is as amazing at 61 as when I saw him at 41. He's the Godfather of rock. Chad Smith, who I admit I had never seen before, was as good as they say. I caught one of Chad's drumsticks at the end of the show which I keep on display by my guitars and amps. People were moshing to get one but when I tried, I won, easy. Chad's sure not AVH; he's Chad! He takes the microphone and cracks you up - he's one of the guys. He thanked the Detroit audience very personally at show's end and seemed to be looking at one fan in particular as being impressive AS a fan! You know who you are! Joe Satriani is incredible as can be, and even more entertaining as a part of Chickenfoot than he is solo, while his concerts are great, this one blew all of them away that I've seen before! 'And Joe's not EVH; he's Joe! Michael Anthony hasn't lost a step with piercing vocals and thunderous bass, maintaining his Van Halen-esque qualities. Quite simply these guys are THEMSELVES, and that means they are ELITE. They played every song on the Chickenfoot album plus "Bitten By The Wolf,"a bonus Chickenfoot album track "Highway Star," the Deep Purple classic and "Bad Motor Scooter," Hagar's first song he ever wrote, recorded with Montrose. Everyone compares the 'Foot with Van Halen and that will continue. Another way you can say "Chickenfoot are themselves" is in that lack of tension, that, with Van Halen, you still feel to this day. For Chickenfoot there is no tension. These four get along, they are all content in their role, nobody is stifling anybody's creative or other interests. Beware the 'Foot!